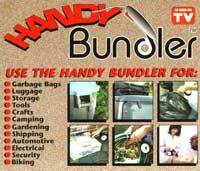 Handy Bundler, wraps, ties and secures just about anything. A great tool for the home, garage, car, boat, camper and office. Super for bundling wiring, garbage bags, luggage, storage items, tools... hundreds of uses. We’re sure you’ll think of some new ones! QUICK AND EASY FASTENER THAT’S AS EASY AS 1-2-3!